Our manufacturing facility in Valdosta, GA provides tent and canopy rentals throughout South Georgia and North Florida. Our inventory also includes lighting, chairs, tables, pole and ceiling drapes, linens, and dance floors. International Tents are sold worldwide! Our tents are of the highest quality. Our unique combination of 100% sailcloth fabric, three ply stress points and steel cable under structure produces a super strong design that will prevent blow downs and provide years of service. 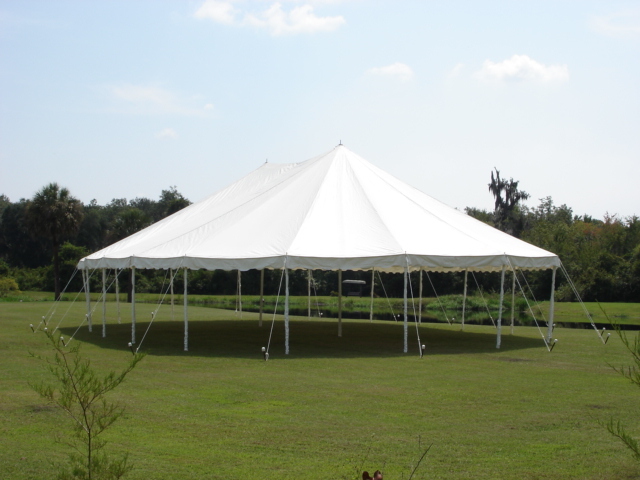 International Tent Inc. is a family owned business that produces tents and canopies for tent rentals, tent revivals, party tents, wedding tents etc. We have over 50 years experience in the tent industry. Contact us today for a Free Quote for your next special event. Click on the link above and "Like" us on Facebook to receive special offers. We have a white 40' x 60' tent on sale for $6,750.00 including deluxe sidewalls with windows and all poles and stakes. This tent has been up a few times but is still in Great condition! List price is $10,445.00. Also, Tent Lighting Package with any tent rental booked this Spring. Just ask for the Spring Special!